We need your help! Our veterinarian bill is climbing again. Several of our animals, like Miss Mika have been spayed or neutered and we've had some unexpected surgeries. If you would like to help us combat these mounting bills you can donate here. Anything and everything is so appreciated! Don't forget we also have wine for sale. The wines presented by Full Moon Farm include a Cabernet Sauvignon, a Chardonnay, a Merlot, a Malbec, a Carmenere and a Sauvignon Blanc. Part of the purchase price of these are donated to Full Moon Farm. Share a bottle of wine with a friend! Full Moon Farm is an organization dedicated to the well-being of wolfdogs. 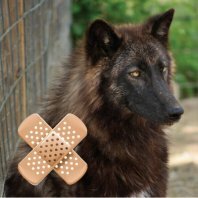 We operate as a federally recognized not-for-profit organization for abused and refused wolfdogs who, through no fault of their own, find themselves in need of love, shelter, and care. We are an organization run completely by volunteers; many of whom also juggle families, full time jobs, and other personal responsibilities. Assistance from people like YOU is what makes this organization successful. Thank you for all you do to help support us. We appreciate everything you do. We can always use your help in any way you can. Use the link above or checks can be mailed to P.O. Box 1374, Black Mountain, NC 28711-1374 if you prefer. It's that time of year again. The gift giving season is coming. Shop for some of our tee-shirts or sweat shirts to help with that list you may have. Or purchase something for yourself. We have several different offers at this time. When you purchase something from one of our Tee-Spring campaigns part of the proceeds come directly to Full Moon Farm. All of our TeeSpring clothing below will be offered ONLY until November 26th. So don't wait, get yours now! Our last Howl in for the year. Come and join the holiday fun with Full Moon Farm! This month's theme is BLANKETS! Gates open at 1:00 p.m. and close at 5:00 p.m.
Farm tours are on the half hour., starting at 1:30. Our Gift Den will be open. We have a variety of beautiful, one of a kind handmade items including cards, jewelry, artwork, and even a limited line of hand-spun hats, scarves and afghans made from fur plucked directly from our springtime shed! Our Howl For the Holidays does not include a pot luck dinner, however we will have delicious warm drinks (coffee, tea, and hot cocoa)! If you want to bring a sweet treat, we won't say no!